It was Batman's 75th anniversary a week ago. This would have been a perfect book to go with it. Really interesting, thanks for sharing! Sounds like a good book for discussion, and love the connection to writers' notebooks. I have not heard of this one either! That's interesting - I did not know this information, nor do I imagine more kids. This would be a good story to share with middle grade. Thanks for the review! Marc Tyler Nobleman has done a great service to readers in writing this book. I thoroughly enjoyed reading it. I think he would be a great author to bring to your school or classroom via Skype. What a treasure this will be, Beth! I'm glad you learned about it, found it, and shared it! Sounds very good. Thank you! So very very cool. Thanks for sharing this here! What an interesting book! Thank you for sharing, Beth! So I love this. I'm thrilled you see various classroom applications for my book. Thanks so much for spreading the word, Beth. It always means a lot. Oh, Xena's Mom (and others): I regularly do school visits around the world (next up: India! ): http://noblemania.blogspot.com/search/label/school%20visit. Here's a sneak peek of what you could expect: http://noblemania.blogspot.com/search/label/presentation%20feedback. Of course I'd love to add anyone here to the schedule! I'm on Twitter at @MarcTNobleman. 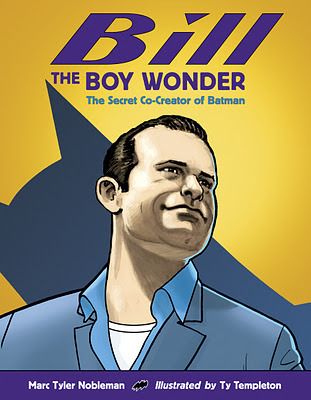 Also, I'm adding this post to my BTBW curriculum guide: http://noblemania.blogspot.com/2012/09/batman-in-classroom.html.